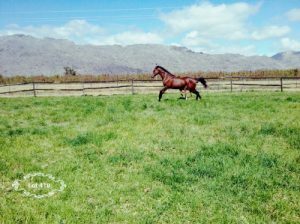 CAPETOWN NOIR – A SIRE OF THE FUTURE! Boland Stud are proud to be offering a colt from the first crop of former Equus Champion Capetown Noir at the 2018 Emperors Palace National Yearling Sale. Capetown Noir, who shares his champion sire Western Winter with Champion First Crop Sire What A Winter, was an exceptional racehorse. 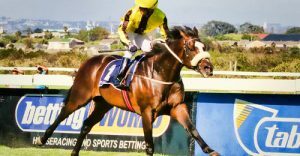 Himself a R1 million buy from the 2011 Emperors Palace National Yearling Sale, Capetown Noir won eight races and earned over R2.7 million during a career which saw him establish as one the best milers seen in South African in many a year. The handsome bay’s victories included the Gr.1 Cape Guineas, Gr.1 Cape Derby and Gr.1 L’Ormarins Queen’s Plate, with Capetown Noir winning or placing in five Gr.1 races. Previous winners of the Cape Guineas include champion sires Captain Al and Jet Master, while the outstanding locally bred stallion Dynasty ranks among the past Cape Derby winners.The Dean Kannemeyer Capetown Noir, South Africa’s Equus Champion Miler of 2014, has been well supported at stud and looks to be well positioned to become the next big South African bred sire sensation. 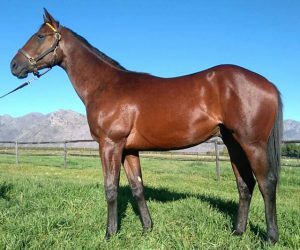 Capetown Noir raced in the famous yellow and black silks of Khaya Stables. 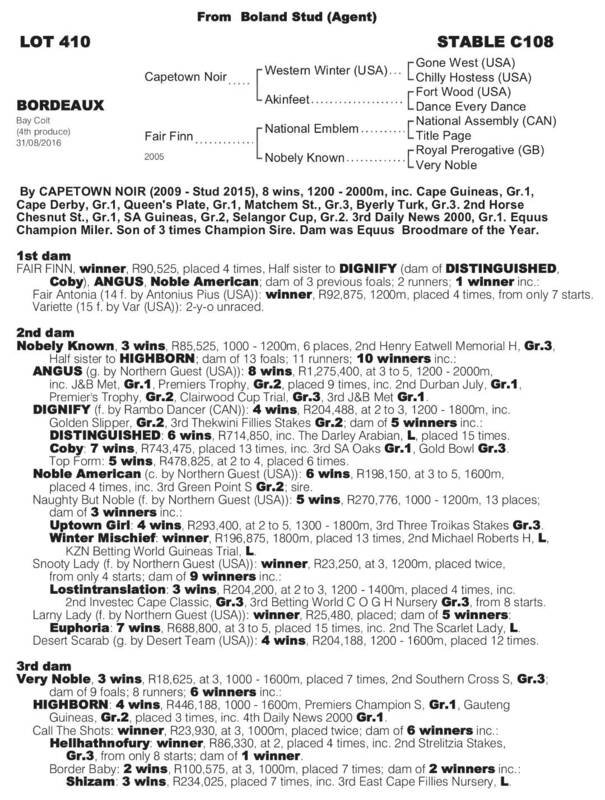 His son Bordeaux (Lot 410) looks to have plenty of upside about him. Himself a half-brother to a winner, the colt is out of a winning National Emblem half-sister to three stakes winners, headed by Gr.1 J&B Met winner Angus and Gr.2 Golden Slipper winner Dignify. 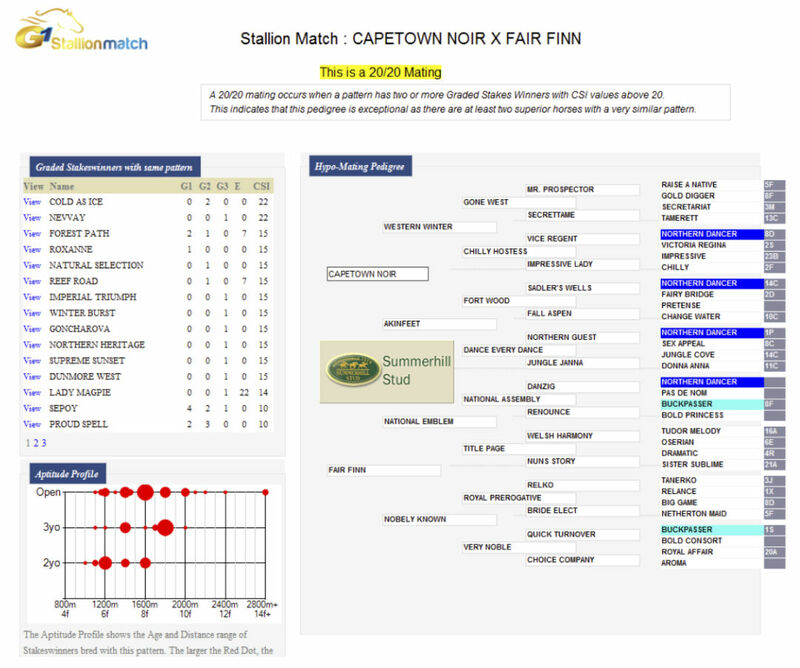 Interestingly, Angus was sired by champion sire Northern Guest –who is broodmare sire of Capetown Noir’s dam Akinfeet. 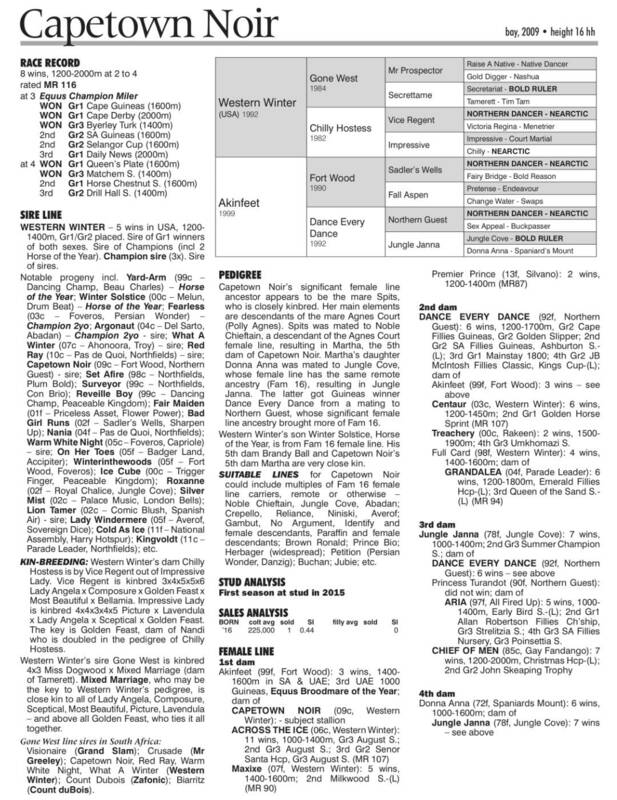 The colt on offer also hails from the same family as Gr.1 winning 2yo Highborn. Broodmare sire National Emblem has made his mark as maternal grandsire, through dual Horse Of The Year Legal Eagle and fellow Equus Champion Seventh Plain.